In May and June 2017, activists in Canada, Israel and France have taken nonviolent direct action against arms fairs. In Ottawa, Canada, 40 activists blockaded the entrance to the CANSEC fair for over an hour. CANSEC is an annual two day event hosting 800 companies from across the arms industries, and attended by 12,000 people. As well as exhibits of weapons and other equipment, attendees were given the opportunity to hear presentations from government ministers and attend evening receptions sponsored by Lockheed Martin. In Israel, activists in Tel Aviv held a die-in inside the ISDEF arms fair, holding banners which read "the arms industry profits from the occupation" and scattering blood stained money across the floor. The activists were eventually expelled, and their action was followed by a large and noisy protest outside several hours later, and a shadow conference called “INSecurity”, which explored the ways Israeli arms are being used both in Palestine and around the world, hosted by the organisation Hamushim (meaning "Armed" in Hebrew). The ISDEF trade show hosts a large number of companies from across the world, and was attended by delegations from over 100 countries including Central African Republic, Congo, Ivory Coast, Cameroon and Myanmar. Many of the companies exhibiting equipment are Israeli, which has become the world's sixth biggest exporter of arms in absolute terms, with exports totally $6.5 billion in 2016. Israeli companies often take advantage of the ongoing occupation of Palestine to test and market equipment used by the military as “battle proven”. 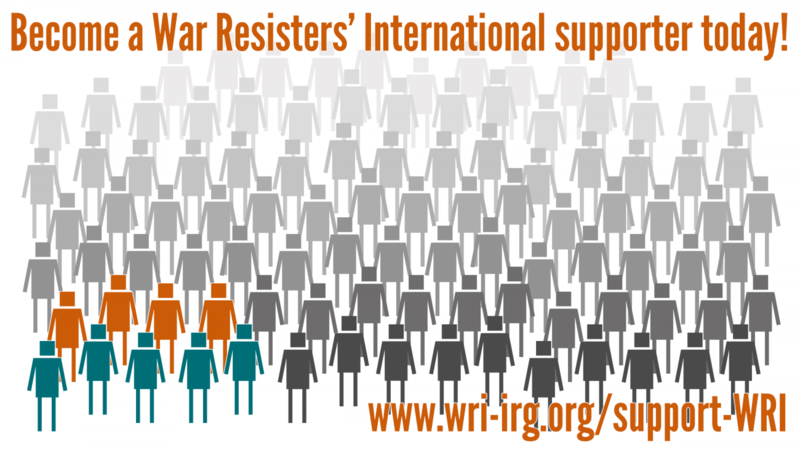 In the Czech Republic, members of WRI affiliate Nesehnuti took action alongside a coalition of groups called Stop IDET against the IDET arms fair, which is held annually in Brno. The fair is regularly attended by representatives from countries around the world including Egypt, Turkey, Kazakhstan, Brazil, the Philippines and Rwanda. Activists hung banners inside the fair, and held a protest in the centre of Brno displaying information about the use of Czech arms in conflict zones around the world.